Its BACK! Hurry and print the $1.50 off any 2 Purex Laundry Detergent Products Printable Coupon. This is making for a SUPER STEAL at your local Dollar Tree. 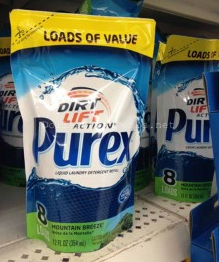 You can find the 8-Count Purex Detergent packs for ONLY $1, making them ONLY $.25 after coupon.